My name and heritage might be German, but I’ll be cheering for the Azzurri this Saturday, July 2, at 3:00 Eastern time and noon Pacific time on ESPN 2 when the Italians take on Germany in the Euro quarterfinal match. After all, once upon a time, my American son dreamed of playing for the Italian World Cup team. He’d lived in Italy from pre-school through second grade and attended the local schools. The whole idea of citizenship thing wasn’t quite clicking for him, and he’d once mistaken a dollar bill for a Deutchmark. 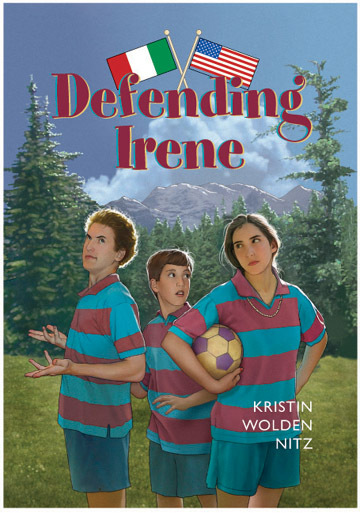 While we lived in Italy, I had the opportunity to watch a local Italian-speaking team play against a local German-speaking team while doing the research for my soccer novel, Defending Irene. So I know some of what will be shouted from both sidelines. “Dai!, Dai! Dai!” from the Italians. It sounds like “Die! Die! Die!” which might have been a bit unsettling to English players even though they undoubtedly expected it. I don’t have a really good translation for dai, but it’s similar to “Come on!” I’ve heard “Ma dai!” used as a protest. If you’re curious about just how passionate Italians are about soccer, consider checking Defending Irene out of your local library. It’s also available in hardcover at Amazon. The Kindle edition, while available for pre-order now, will be released on August 9th. I’ll include an excerpt from the first chapter in the coming days.